No Asian beach destination would be complete without the opportunity to enjoy a good massage and Arugam Bay is no exception. Below is a list of places offering such services; expect to see more and more added to the list every year especially during high season. 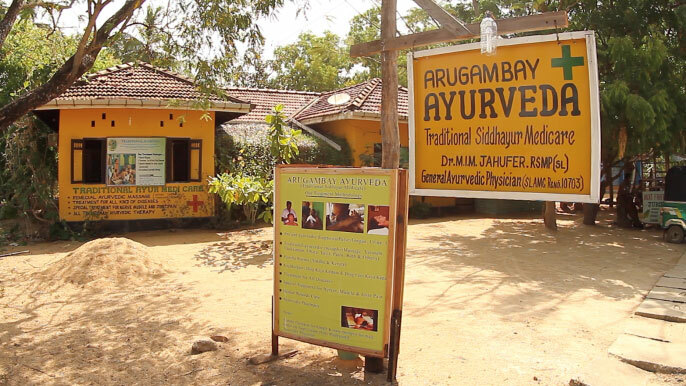 A slightly touristic yet rustic place offering traditional ayurvedic massage by local male or female practitioners. It is located here (opens in Google Maps) opposite the Buddha statue on the only bend in the main road. See the business listing for contact details. Certified massage, physiotherapy and craniosacral therapy from a Finnish national located at the Spice Trail. See the business listing FixingPoint for more information. All year round operating with a local male therapist and a wide selection of ayurvedic oils. June to October. Western male and female therapists offering massage and a wide range of alternative treatments. See their website (opens in a new window) for details. A new spa opened at the Blue Wave hotel in May 2017. See Latest News for more info. As a guide $25 to 30 per hour but prices vary a lot. They are obviously highest during July, August and September when it is also a good idea to make reservations. Outside of peak season it should be possible to negotiate 10 or 20% off the listed price.